Welcome to a new addition to the SpotterGuides.com family. The TORA CJ Wilson Racing Cayman Cup Spotter Guide is a new guide to showcase entries in the Forza Motorsport 6 based Virtual Racing series run by CJWilson Racing and TORA, The Online Racing Association who are recognized by the MSA UK, the governing body of British motorsport and it has a significant membership in North America. 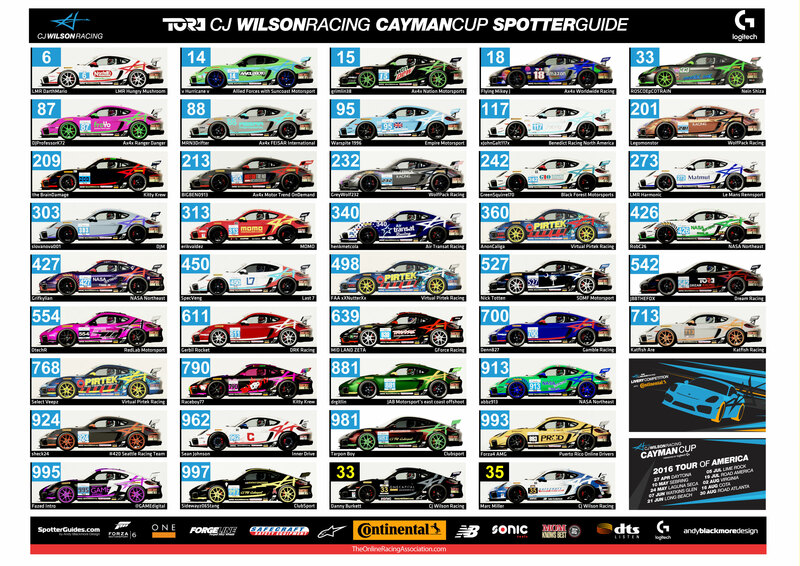 Championship entries were invited to supply their CJ Wilson Porsche Cayman’s to this Spotter Guide and in turn have a chance of winning a set of Continental Road Tires for their every-day vehicle. The Announcement press release follows at the end of this article. 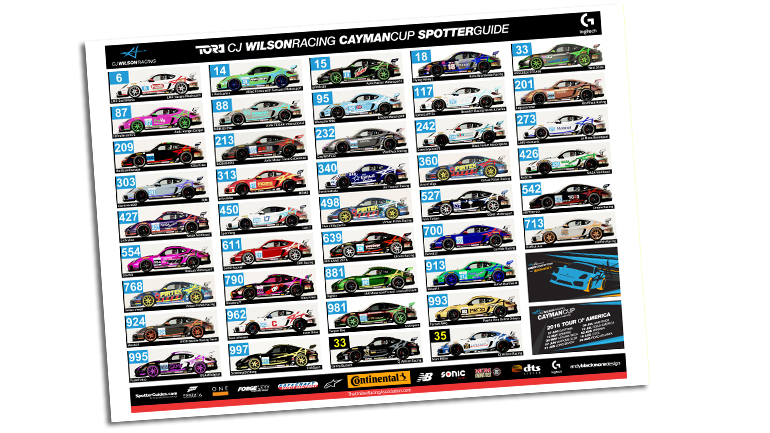 You can download the TORA CJ Wilson Racing Spotter Cayman Cup Spotter Guide as a JPEG or a PDF. You can learn more about the championship at the TORA website. 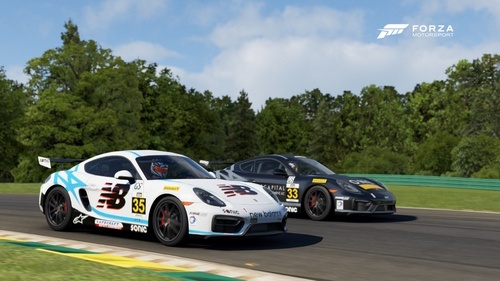 CJ Wilson Racing has today announced the launch of the 2016 CJ Wilson Racing Cayman Cup for Forza Motorsport 6. This ten race virtual series for the 2015 Porsche Cayman GTS will be run in partnership with The Online Racing Association (TORA). The UK based Online Racing Association is recognized by the MSA UK, the governing body of British motorsport and it has a significant membership in North America. 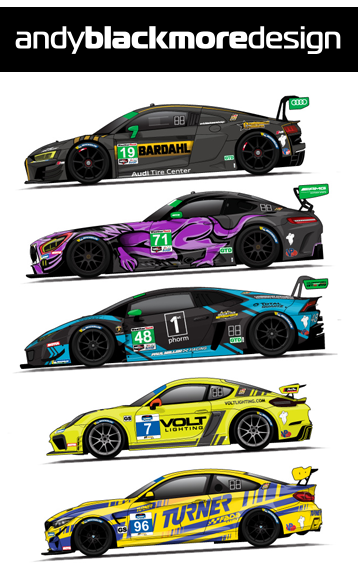 CJ Wilson Racing and its drivers have worked closely with TORA to create a base model car that matches the team’s Continental Tire Sportscar Challenge Porsche Cayman GT4 Clubsport as closely as possible. The driver of the #33 ONE Capital/Motor Oil Matters car, Danny Burkett, has done many virtual laps in order to match both the performance and handling characteristics of the Forza Motorsport car to the real thing. 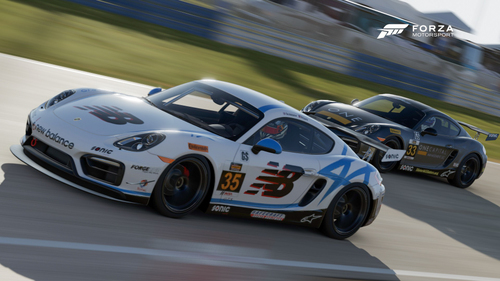 TORA’s development work with the young Canadian sportscar ace truly paid off as Burkett was able to get the Cayman Cup car down to a time of 2:17.1 seconds around Sebring which is only half a second off his actual race pace from the Continental Tire SportsCar Challenge race last month. “I think people are really going to get a kick out of driving the car, it truly is an accurate representation of what it is like to drive the CJ Wilson Racing Cayman and people are going to have a lot of fun fine tuning and customizing the car to make it their own,” enthused Burkett. Starting on April 26th, the Championship will run throughout the Spring and Summer culminating with the finale at Road Atlanta on August 31st. CJ Wilson drivers, Danny Burkett and Marc Miller will be making regular guest appearances in the events throughout the season. The prizes for each race and the overall Championship winner will be confirmed shortly. For more information please go to the TORA Forum pages here.